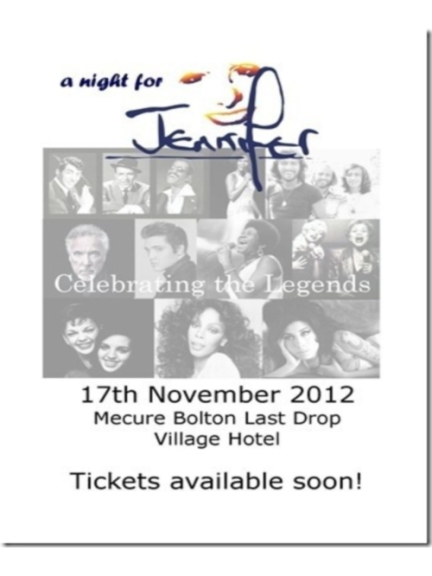 The month of November sees the third year anniversary of the first ever A Night For Jennifer, hosted by the Jennifer Charity. And it is looking to be the best one yet with some great acts scheduled to appear, alongside some great entertainment and some delicious food. Be Minor - Consisting of 4 very talented individual singers who have joined together to create a vocal harmony band, this girl group reached the final 60 of last year's Britain's Got Talent, before just missing out to eventual finalists New Bounce. With ages ranging between 13 and 14, they're definitely primed to take the country by storm. ReConnected - Described as "Manchester Pop Sensations", members Matt, Max and Harry, like Be Minor, made their mark on Britain's Got Talent as finalists. Indeed, the connections go further between the two young groups as Max and Harry are the brothers of Be Minor's Daisy. They recently sold out two shows at Sound Control in Manchester where they nearly caused the venue roof to take off, a venue which has seen the likes of Pixie Lott, Professor Green, taio Cruz and Chipmunk perform in the past. Lauren Thalia - Another performer with Britain's Got Talent pedigree, Lauren reached the semi-finals of the 2012 edition, where she gave the judges and audience a taste of her talent and originality. Drawing her inspiration from such as Rihanna and Jessie J, she's an accomplished drummer, guitarist and singer-songwriter, all rolled into one. Redd - Amy Louise Aldred, better known by the stage name Redd, may not have made it through boot-camp in last years X-Factor, but that hasn't meant her dreams haven't come true in the meantime. Her single, I'm Day Dreaming, charted in it's release in Germany at number 2 on the Hip-Hop chart, and 26 in the main chart. And it received the backing of two music heavyweights in the form of Akon and Snoop Dogg. Amazing. She brings that talent to A Night For Jennifer this year. Father & Son - Not only did they make it to the semi-finals of Britain's Got Talent 2010, but it is because of this father-son team that the Jennifer Charity exists. Following the death of Jennifer in 1985, Graham Edgington (Father) was left as a single parent of a 16th month old baby. Not only did he have the pressure of bringing up James Edgington (Son) alone, he had to find his own time to grieve and work a fulltime job. Twenty-five years later, James extensively researched widowed fathers and was alarmed at the lack of supportive organisations aimed at widowers in particluar. There are exceptional bereavement charities and organisations helping single parents often single mothers but nothing for men. And so the Jennifer Charity was born. For more information about all the acts, and to see when more are added, clickhere. The evening will be hosted by John and Vix of the Tower FM show. Tickets are priced at £30 and include a drinks reception and canapes, an evening meal, coffee and cupcakes, live entertainment and a DJ. To reserve your tickets, fill out the form located here or call 07745 447 286. To learn more about the charity and what they do, click here to visit the Jennifer Charity official website.